Training this evening (Tuesday 25th October 2011) has been cancelled due to a waterlogged running track. 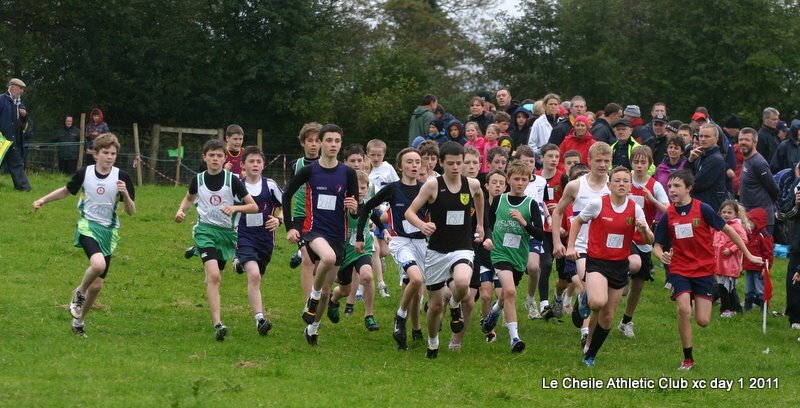 Leinster XC Championships even ages U12 - 18, Master Men & Women & Novice Men & Women will take palce on 30th October 2011 in Belvedere House, Mullingar, Co. Westmeath. 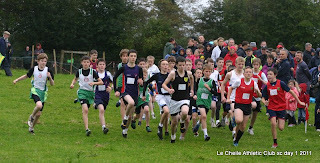 The Uneven ages U11-U19, Inter Men & Women will take place on 1th November 2011, Adamstown, Enniscorthy, Co. Wexford. 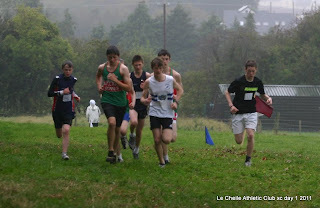 County Kildare Training Sunday 16th October, 2011 for Under 12 Upwards will be held at Celbridge AC running track. Training includes Sprints, Jumps and Throws. Meet at 11:30 am. All athletes Under 12 upwards welcome. For those attending county Squad Cross country training Sun 16th October, 2011 at 11:30am - For U11's and upwards, the directions can be found here. All athletes U11 and upwards welcome. Training has been cancelled today 13th October 2011, due to the death of Noeleen Brennan, wife of Tony and beloved mother of Ciara, David, Eabha. Our thoughts and prayers are with Tony and Family. May Noeleen Rest In Peace. 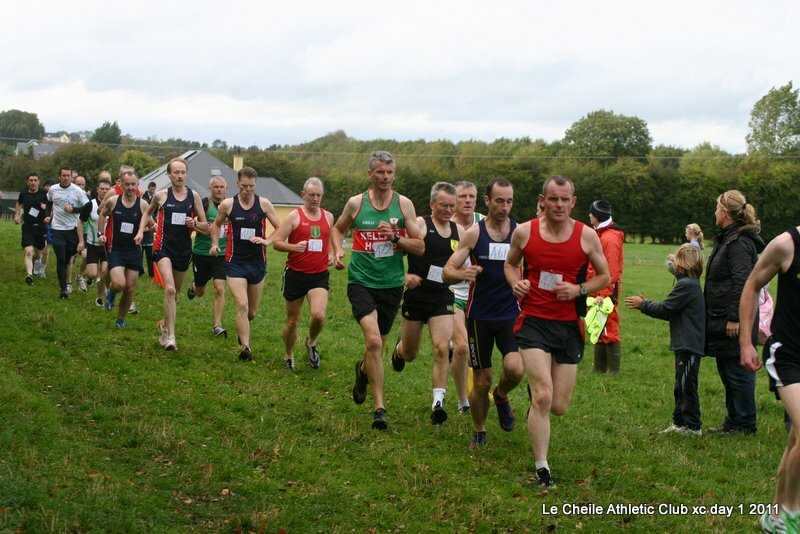 There was a great turnout by Le Cheile at Day 1 of the Kildare Cross Country Championships held at Crookstown on 25th September, 2011. The conditions were poor but the rain did not deter almost 30 Le Cheile athletes from making the trip. The course was also a difficult test as it was quite hilly and this may have been a bit of a shock to the system for some of our younger athletes. For many of our younger athletes it was their first Cross Country Race and despite the conditions all performed really well. Of particular note were Oran Hayes and Caoimhe Cronin who both achieved top 10 finishes in the boys and girls under 10 races. There were top 15 finishes for Eaibhin Grimes and Carragh Hayes in the Girls Under 12, Emma Browne also ran well finishing in mid division. In the boys Under 12 Alex Byrne and Conor Murnaghan ran very well again finishing mid division. Ciaran Connolly a strong contender in the boys Under 12 turned up at Crookstown but unfortunately could not run due to illness. In the girls Under 14 Fina Hayes was the sole Le Cheile representative and did very well in what was a very strong field. Fina continues to improve, although she did not feature in the medals on this occasion. In the boys Under 14, Conall Hayes, Thomas Connolly and Liam Murphy lined up in what was also a very strong field. Conall while leading the race and looking very strong was forced to withdraw due to injury. Liam went on to finish in a creditable 5th place with Thomas not far behind. In the boys Under 16 Sean Flanagan ran an incredible race to finish 2nd. During the race Sean had fallen back to 4th place but dug deep and found enough to improve two places in the last third of the race. 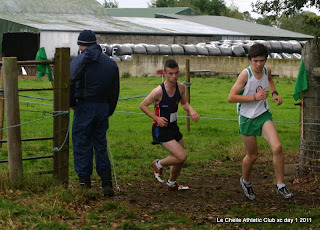 Darragh Nolan also ran a great race in tough conditions to finish a very creditable 5th. 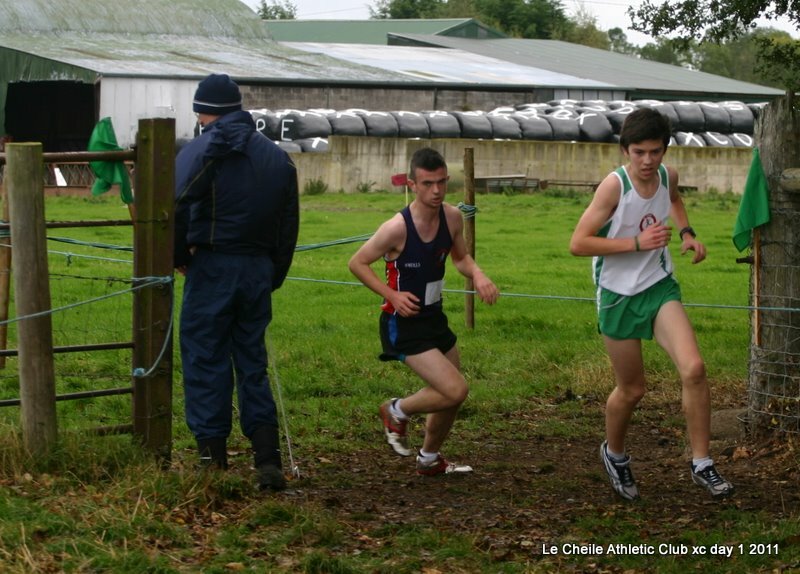 Conor Murphy claimed the Gold medal in the Boys Under 18. Conor ran a smart race staying with his main rival for most of the race but keeping enough in the tank to sprint clear in the final 400. Well done Conor. The Masters men proved to be the most exciting race of the day. 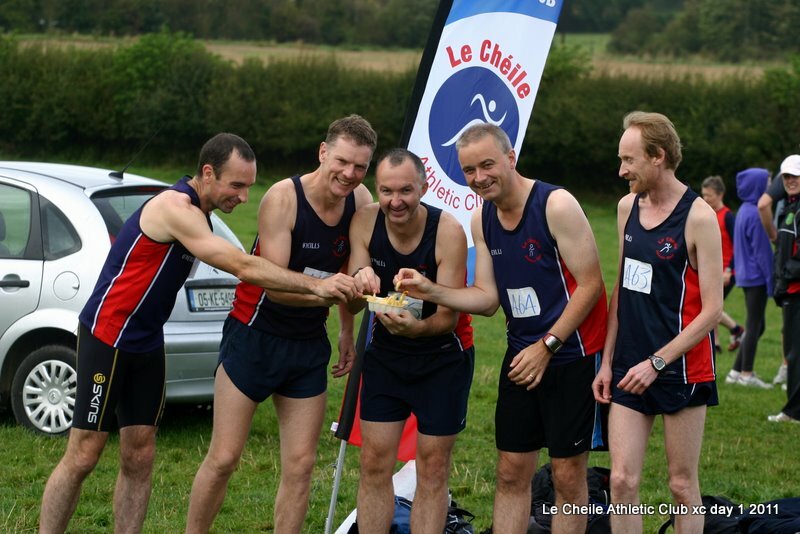 Le Cheile athletes John O’Regan, Tony Brennan, Des Walsh, Ulf Pilarp and Pat Hayes made up a very strong Le Cheile team in a very large field. 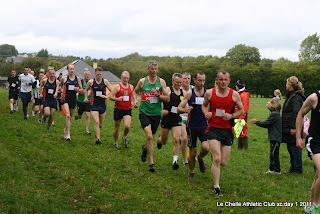 Le Cheile claimed gold with John O’ Regan finishing in 3rd Tony Brennan a close fourth followed by Ulf, Des and Pat.